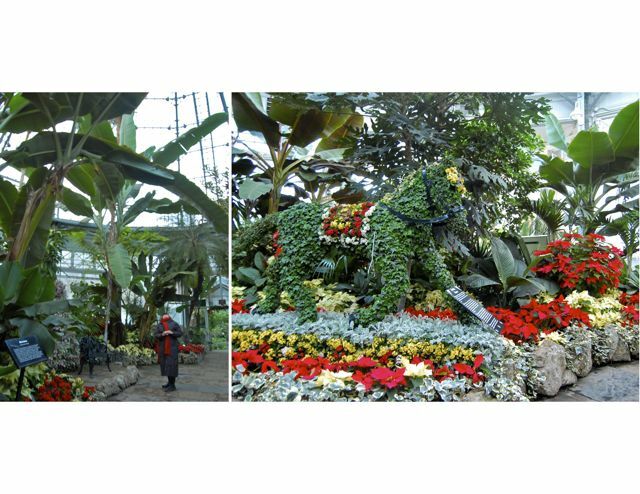 When the weather outside is frightening… we prescribe Allan Gardens for an injection of the tropics. Sarah and I recently dropped by an hour before closing for quick, medicinal treatment from their Christmas display. That jumble of colour at the bottom right above doesn’t make a great photo, but it does represent the joyous profusion that greets you inside. Here, you see us, exiting as we arrived (by the back door to the tiny parking lot on Horticultural Avenue – a grand name for something closer to a lane. Remember it, all ye who seek to park.) The polite gentleman advancing on Sarah is about to announce closing time as we try for some last shots before we leave. 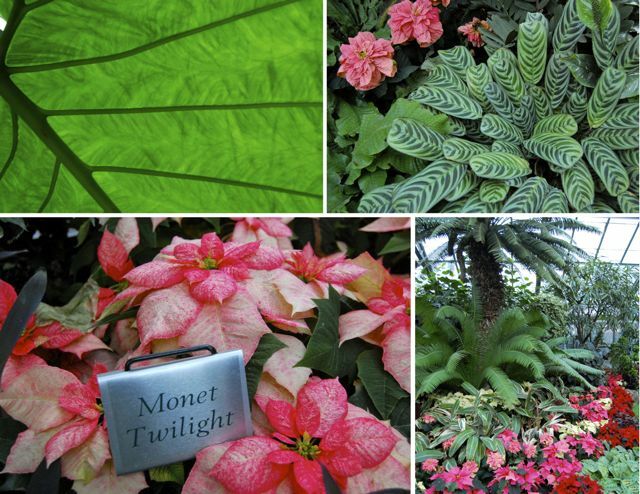 “Who was Allan Gardens named after? 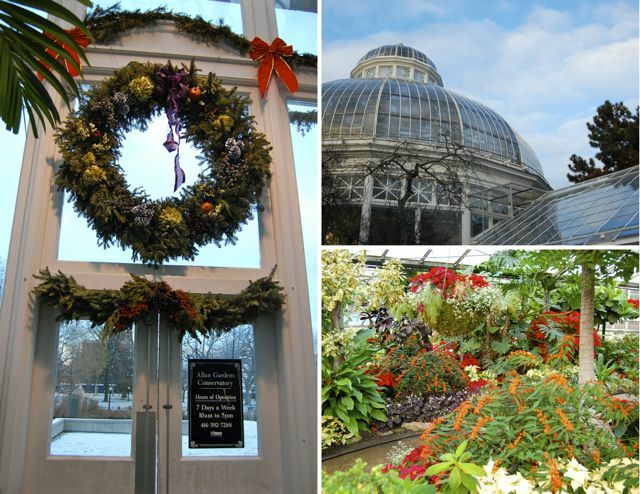 I love Allan Gardens at all times of year, but the three seasonal shows make it worth special excursions. I wrote about the spring show here back in March 2008. There’s also a fall show, which I’ve never seen, that focuses on chrysanthemums. 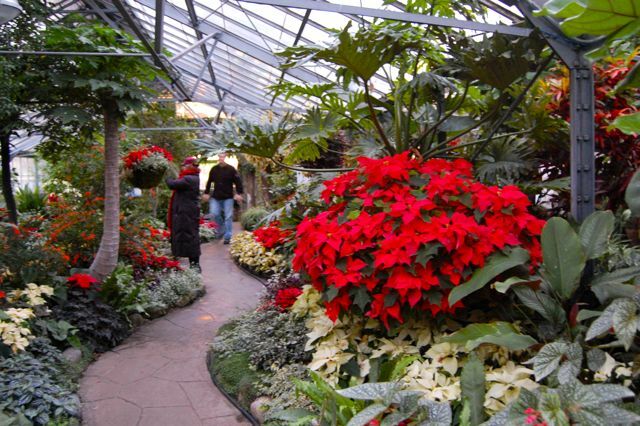 To my mind, this is how poinsettias are best seen – in mass. On my first (and only) visit to the Caribbean, I was astounded to see poinsettias growing into large shrubs or even small trees. Since then, the single pots at grocery stores have seemed lacking. I rarely buy them. If you have a poinsettia, with the right care you can get it to rebloom. The main key is to keep your plant in total darkness (that’s: total darkness) to simulate long, dark nights for about two months before the desired blooming period. If you want to give it a try, here’s a good poinsettia info sheet from the U of Texas AgriLife Extension Service. In the Palm House, you can’t help but feel like a kid under the giant banana leaves. Here, a fauxpiary rocking horse is one of the successful seasonal decorations clustered between this year’s floral plantings. Other set pieces (notably the gussied up Leda and the Swan fountain and some too-twiggy gold-painted branches hung with red balls) were oddly haphazard and incohesive. Dare I use the overused: random? These minor quibbles aside, it’s hard not to love being here. Even when, like now, rain has dissolved any remnant of the wintery white stuff on Toronto’s streets. 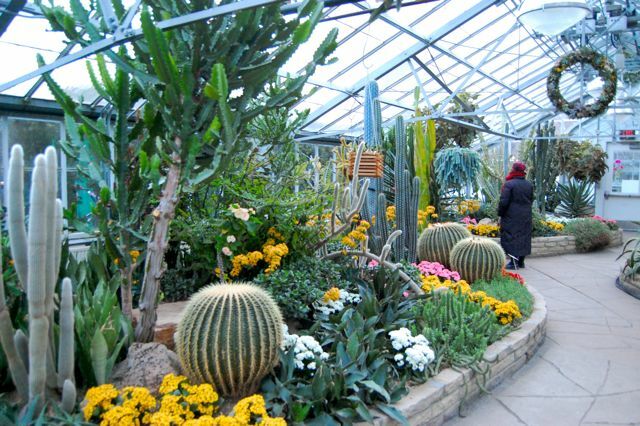 The cactus house remains one of my favourite destinations. 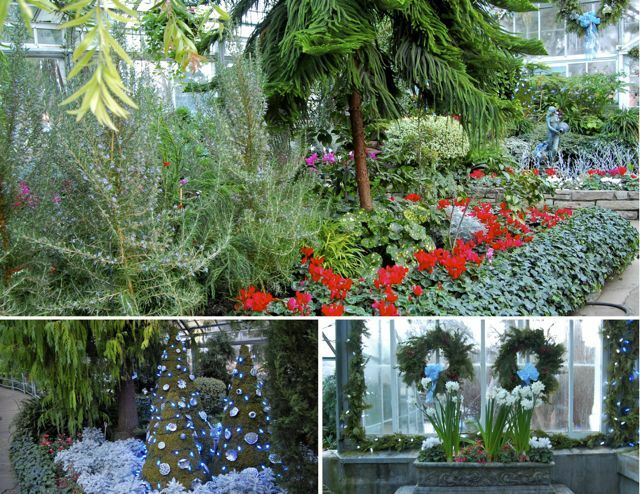 Allan Gardens Conservatory is open every day of the year, from 10 am to 5 pm. It’s right downtown, between Carlton and Gerrard, west of Sherbourne. And it’s free! 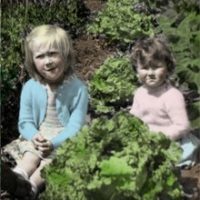 Great post and I really look forward to visiting some gardens with you in 2010. Happy New Year. I love the Cactus House. It is so fun for me to see cactus growing in other areas. I wish for you a very Happy New Year. The Allen Gardens are lovely. You are right about poinsettias looking better in mass. I kept one through the summer one year, and it looked great with nice green foliage until October, when it promptly died! Thanks for a great post – have a happy and productive 2010. 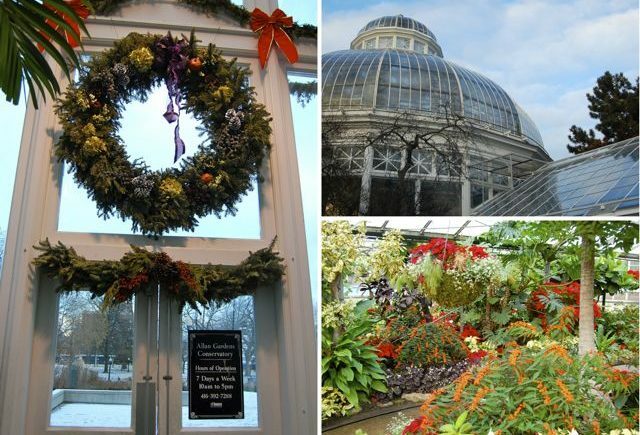 You are fortunate to have such a wonderful conservatory in your area. Alas, we here in Anchorage do not anything like it and must case the plant nursery/gift shop stores to get our winter fix of green. Loved the pic of the man advancing to show you the door! The cactus house shot was my favorite, too. HI Helen, Nice place. Closet one like it to us is about 1-1/2 hours away. http://www.towerhillbg.org/thweborang.html great place to visit in all seasons.